​On the second weekend in August, Reiki practitioners from around the world gather on the sacred lands of Breitenbush Hot Springs in the Cascade Mountains of Oregon to share Reiki in a lively and diverse international community. 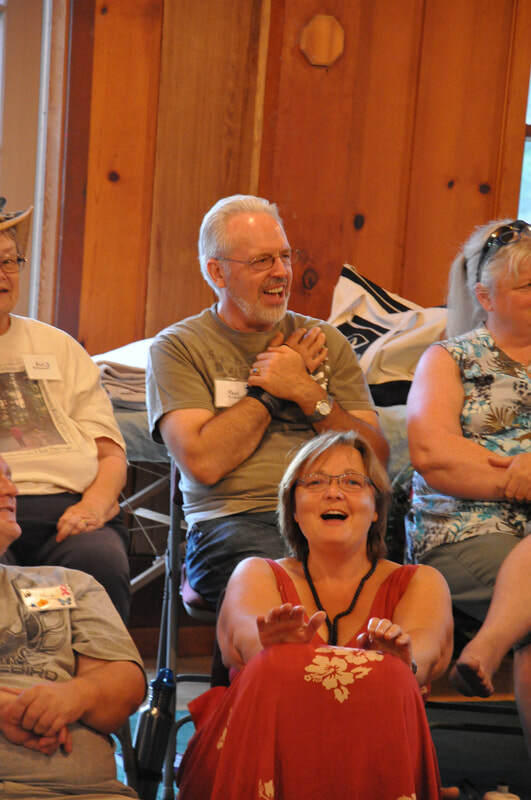 For many in the community who return year after year, the Gathering is a joyful homecoming. The Weekend program is filled with inspiring talks from our guest speakers, large and small group discussions, group table Reiki and partner Reiki sessions, free time Saturday afternoon, stories, singing, laughter, hugs, and a few tears when we say goodbye until next year. There's even a dance Saturday night to celebrate our journey! The Weekend portion of the Northwest Reiki Gathering is open to initiated Reiki Practitioners of all levels. Accommodations are simple, rustic cabins with three vegetarian meals each day. Limited tent camping sites are also available. Arrival time is 4:00 pm Friday, with Registration check-in and moving into cabins, followed by dinner at 6:00 pm. The Weekend Gathering ends with lunch on Sunday. Enjoy soaking in natural mineral springs, relaxing in the natural steam sauna, walking the Labyrinth, hiking the beautiful trails in ancient old growth forest, sunbathing by the river, or even take in a massage or Reiki treatment! It takes many hands and warm hearts to make the Gathering a success. Parking lot greeters welcome participants as they arrive at Breitenbush. Cabin Blessing Angels bless the cabins and prepare the space of our cozy home away from home. Room Angels arrange our Gathering space in the lodge, setting up chairs and Reiki tables. We also need volunteers to provide Reiki to the Breitenbush Staff who take great care of us during our stay. Please consider lending your talents and select the designated check box on the online registration form if you wish to volunteer, and you will be contacted by our Volunteer Coordinator. We have a limited number of scholarships available for the Weekend Gathering.. If you would like to apply for a scholarship and you were not awarded a scholarship in 2018, please request a Scholarship application by selecting the designated check box when you complete the online registration form, or contact our Registrar. Scholarship applications are due by April 1, 2019.